Everyday Modern Mystics – starting soon! Are you Crazy About God? 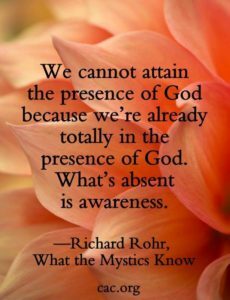 experience-of the Presence & Love of our Living God. to gather Mystics into free-form, Community. I hope you come PLAY! Open a private Facebook group for us. (folks from any or no faith-tradition). And sharing these interviews with our community. I would really like your assistance to get this going. 1) if you want to be in-on this Mystic Community, sign-up here. 2) if you know folks who might be interested, please share with them. so your sharing about what you need & desire & want to do and share… is much appreciated. 4) I am looking to interview folks about their experience of God. Do you know someone, whose direct experience of God may be inspirational? I would love it if you introduced me – or invited them to connect with me. 5) I am currently doing a poll, for folks who are invested in this idea – on what days/times work for you – if you would like to meet once or twice a month online. Let me know days and times that tend to work for you. Right now, it is all wet cement – so please let me know what you would Like, and what you Can do. I look forward to hearing from you today! Meister Eckhart quote at top of website is also how I see the ‘world’. wow, I didn’t know, Maria-Louise.